The natural for each bank is the desire to attract as many customers as possible while letting in as much money as possible. The influx of customers directly depends on the convenience of making payments at branches and reception points of the bank. This applies to both the maintenance time and the information support of the cash registers. For users it would be more convenient to see the information on their personal account at the current time and not just pay a receipt with the data current at the time of printing. It is also natural for the bank to strive to reduce its costs for accepting payments and improve the reliability of this process. You can advance in this direction due to an automatic connection of the payment acceptance program with service providers. The information system of Housing and Utility Sector "BAS-Population" provides the necessary opportunities for solving the above-mentioned tasks of the bank. It allows two-way data exchange with service providers or Payment-Processing Center in a fully automatic mode to eliminate the human factor. It increases the reliability and efficiency in work. 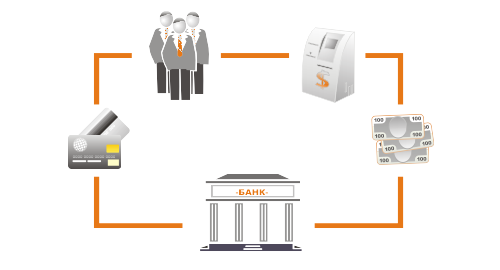 Means are provided for communication with the banking system. Fiscal printers are sometimes used, but this is not necessary. In Ukraine, banks can operate without cash registers. In this case, the system provides for an audit of the cashier′s actions. Communication with the banking system occurs mainly with the use of export payments in the structure that is required for downloading to the banking system. But there are solutions when the bank programmers from their system read the information directly from the database of the payment module "BAS-Population". The BAS database is open not only for maintenance but also for modifications by third-party programmers. The information system "BAS-Population" also implements payment support through automatic payment terminals. The software of the system has special means for accounting the composition of terminals, transferring information to terminals, accepting payments and checking payments with the bank. The scheme of communication with suppliers of public services.